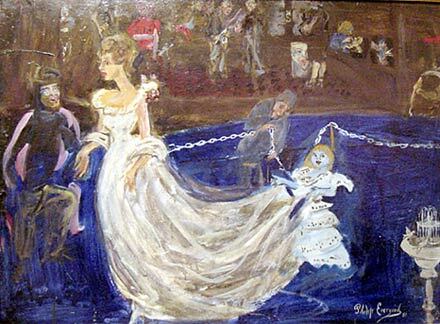 The Wedding, oil on canvas, 20"x27", 26.5"x33.5" fr, s.l.r. Born on October 26, 1901 in New York City. Name was changed from Blashki to Evergood. Went to England, Belgium, Paris, Italy, Spain and back to NYC. Studied at Eton, Cambridge University, Slade School in London where he studied drawing under Henry Tonks and sculpture with Havard Thomas, Academie Julian with Jean-Paul Laurens and Andre Lhote. Joined Public works of Art Project and the Federal Art Project of the WPA (1934-1937). Taught at American Artists School. Known for murals. Exhibited: National Academy of Design (1924); Salon dAutomn (1925); Dudensing Galleries (1927); Montross Gallery (1929); Whitney Museums Second Biennial (1934) and included in its subsequent Annuals; Denver Art Museum (1935); Athenaeum Gallery, Melborne, Australia(1937); Gallery 63, Rome, Italy; Kennedy Galleries, NY; Kalamazoo Institute of Arts (1940); Lehigh University (1943); and many more. Member: American Artists Congress; Artists Union (president); United American Artists; Artists Committee of Action ,Artists League of America; American Society of Painters, Sculptors and Gravers; An America Group; National society of Mural Painters; Artists Equity Association (founding member); National Institute of Arts and Letters. Awards: M. V. Kohnstamm Prize; Arts Institute of Chicago; Carnegie Corporation Grant; Metropolitan Museum of Art Artists for Victory exhibition; Second prize, Pepsi-Cola Portrait of America Exhibition; Second Honorable Mention, Carnegie Institute; Second Prize, Franklin D. Roosevelt Competition; William H. Tuthill Prize, Art Inst. of Chicago; Alexander Shilling Purchase Award; Second Prize, La Tausca Art Competition, NY; American Prize, Hallmark Art Award, NY; Carol H. Beck Gold Medal, Pennsylvania Academy of the Fine arts; Second Prize, Carnegie Institute; Second W. A. Clark Prize, Corcoran Gallery of Art; First Prize, First Long Island Art Festival; First Prize, Terry Art Institute, FL; First Prize, Baltimore Museum of Art; Grant for Painting, American Academy of Arts and Letters; Temple Gold Medal, Pennsylvania Academy of the Fine Arts; Benjamin Altman Prize 146th Annual Exhibition of the National Academy of Design. In the collection of: Phoenix Art Museum; Wadsworth Atheneum; Hirshhorn Museum and Sculpture Garden; National Gallery of Art; Smithsonian American Art Museum; Corcoran Gallery of Art; Georgia Museum of Art; Vatican Museum: picture Gallery; Museum of Fine Arts, Boston; Brooklyn Museum of Art; New York University Collection; Metropolitan Museum of Art; Whitney Museum of American Art; Pennsylvania Academy of the Fine Arts; Hunter Museum of American Art; Dallas Museum of Art; among others.